A selection of hardy perennials all trialled, propagated and grown at the Nursery. Double white flowers on tidy plants. Height to 60 cm. Spread 40 cm plus. Lovely cultivated form of yarrow with deep blackcurrant coloured flowers. Height to 80cm, spreading. Erect, tough perennial with deeply divided, glossy, dark green leaves. Dark blue flowers in abundance from early summer. Good in sun. Height 1m plus. Spread 60cm. A short lived perennial with tall stems bearing dark, nearly black, open flowers. Good in sun and shelter from strong winds. Height to 1.8m. Upright bushy plant with fine narrow leaves. Plentiful light blue starry flowers. Slow to establish. Leaves colour in autumn. Height to 60cm. Spread 30cm. White daisy flowers spring from red buds on attractive ferny foliage. Height to 15cm. Soft silver foliage and white everlasting flowers. Best in full sun and free draining soil. Height to 40cm. Pretty divided leaves and large creamy flowers. Happy in semi-shade. Height to 20cm. Attractive leaves and large, deep pink flowers with prominent stamens, in late summer. Enjoys humus rich but well drained soils in semi shade. Height to 80cm. As above, with large white open flowers. Height to 1.2m. Various varieties are offered during spring and early summer. Lovely plant for sunny sites. Mounds of small leaved foliage smothered in open white flowers. Good drainage preferred. Height 15cm, spread up to 30cm. Low tuft forming sea pink with numerous white flowers. Height to 20cm. Large thrift, strong grower with pom-pom flowers in various shades of pink. Well drained soil in sun. Height 60cm, spread 40cm. Grown for its glossy green, veined white, leaves which emerge in early spring. Will spread slowly once established. Height to 12cm. Deep blue daisies on low clump forming plant. Free draining soil in sun. Height and spread to 30cm. A Michaelmas daisy with large violet blue flowers. Reasonable soils in sun or part shade. Height to 50 cm spread to 25cm. 'Andenken an Alma Potschke' - cerise-pink to 90 cms. 'Quinton Menzies' - purple-pink to 140 cms. 'Faith' - deep lavender-blue to 75 cms. 'Jenny' - purple-red to 40 cms. 'Marie Ballard' - double, lavender-blue to 100 cms. 'Mistress Quickly' - violet to 90 cms. 'Priory Blush' - double white, fading pink to 100 cms. 'Sheena' - double pink to 100 cms. 'Thundercloud' - dusky purple to 90 cms. Pretty lobed leaves forming a dense clump and masses of pincushion flowers. White flushed wine red. Height 70cm. Spread 50cm. Cultivated daisy with double flowers in red, pink, peach and white. Height 15cm. Small bergenia with shiny leaves, colouring red in autumn, and small purple flowers in spring. Height to 15cm. Strong growing perennial for semi-shade. Producing large heartshaped leaves flecked with white, and masses of forget-me-not flowers in spring. Height to 35cm, spread 50cm. Dwarf Campanula with clusters of blue bell flowers with white centers. Height and spread to 10cms. Strong growing bell flower producing a pyramid of dark blue flowers. Height to 60cm slowly spreading. Large, strong growing campanula producing many stems bearing masses of flowers in violet blue. Height to 1.2m. Spread 75cm. Tidy mat forming perennial producing slender spikes of large white bell flowers through mid-summer. Height to 60cm. A blue form of the above. Delicate but tough! Tiny leaves on mat forming campanula covered in many starry lilac blue flowers. Height to 10cm. Reliable perennial bearing trailing sprays of open bell flowers in violet. Height 15cm. Large flowered bell flower. White or rose with red flecks. Height to 70cm. Spread 50cm. A large campanula with glossy leaves and large tubular bells of lilac-white with maroon spotting inside. Height to 50cm. Low rosette of spiny, lobed leaves and a large decorative silvery white bloom, which can be dried. Likes sun and poor free draining soil. Height to 30cm spread 20cm. Lovely blue flowers on branching stems from a basal rosette of grey green leaves. Height to 80cm spread 40cm. Striking evergreen. Rosettes of silver sword shaped leaves and large daisy flowers in summer. Likes sun and well drained soil. Height and spread 30cm. Large yellow, thistle like flowers during summer. Height to 1.4m. Perennial blue cornflower. Vigorous clump forming plant with grey leaves and large deep blue thistle-like flowers. Height to 45cm. White flowered form of the above. Light yellow flowers freely borne on delicate foliage. Height to 1 m.
Clump forming perennial with cornflower like pink-purple flowers and silvery foliage. Height to 45 cms. Loose clumps of glossy leaves. Many branching heads of red flowers, loved by butterflies, throughout summer. Best in poor, well drained soil in full sun. Height and spread 75 cm plus. May seed. Deep red thistle-like flowers on strong stems from large clumps of deeply indented leaves. Height to 1m. Lovely relative of the primula family with soft leaves and sprays of bell-like flowers in pink. Likes moist soil. Height to 20cm. A wild form of our familiar Delphinium, producing slender, branching stems bearing deep blue flowers. These stems require no staking. Height to 1.5m. Strong growing delphinium with strong stems bearing large open flowers. Height to 1.5m. Scented old fashioned pinks with a long flowering period. Best in sun and poor well drained soil. Cut back hard after flowering to maintain compact plants. Height to 45cm. Unusual pink with fine foliage and small intensely pink flowers on thin stems which daintily catch the breeze. Height to 40cm. White with red centre. Height to 25cm. Dark foliage and deep red flowers. Height to 25cm. Pretty ferny foliage and heart shaped pink flowers. Running rootstock allows this charming plant to wander. Likes semi-shade. Height to 25cm. Enjoying moisture retaining soil, this foxglove produces a rosette of glossy dark green leaves and, in its second year, a tall sturdy spike of rusty yellow flowers. Can be a short lived perennial. Height to 1.5m. Clump forming plant with oval leaves and strong stems carrying clusters of flowers in pink with reflexed petals. Will become dormant after flowering. Height to 25cm. Mound forming plant with heart shaped glossy leaves and many yellow daisy flowers in spring. Prefers shade and moisture retaining soil. Height to 45cm. Not the usual form, this species carries yellow daisies on tall stems throughout the summer. Forming gently creeping mounds of soft foliage, it enjoys part shade. Height 1m. Spreading, but not aggressively! Scalloped leaves and hooded blue flowers. Likes sun and free-draining soil. Height to 15cm. Glossy dark green leaves, stems flushed purple and large, daisy like, purple-red flowers with a dark conical centre in summer. Happiest in sun and prefers humus rich, moist, but well-drained soil. Height to 80 cms. Large, strong growing Echinacea with striking purple-pink flowers on strong stems. Height to 1 m.
A white flower form of the above, with down swept petals and a honey fragrance. Height to 75cm. Tall, sturdy stems, from a clump of glossy deeply divided thistle leaves, are topped with a globe of tiny blue flowers. Enjoyed by bees and butterflies. Height 1.5m. Strong barrenwort with yellow flowers in spring and attractive glossy leaves which persist well into late winter. Height to 25cm. Purple-blue daisy flowers. Likes free-draining sunny sites. Height to 25 cms. A double daisy, with lavender blue flowers on strong stems. Height 40cm. A pink form of the above. Pretty, ferny leaves of deep green and clusters of open bright pink flowers throughout summer. Height to 45cm. Soft mounds of scalloped leaves and clusters of open white, blotched red, flowers throughout summer. Needs sun and poor well-drained soil. When happy will self seed. Height to 30cm. Evergreen rosette of strap-like leaves, edged with fine spines. Tall, sturdy stems carryi greenish thistle-like flowers. Protect from extreme cold and wet. Position carefully due to spines. Height 1.5m. Spread 60cm. A rosette of shiny oval leaves produces branching stems bearing numerous small blue thistle flowers. Silver headed form of the above. Tall, sturdy perennial with pink tiny flowers in large clusters attractive to butterflies. Height 1.5m plus. Whorls of soft purple-red foliage and bright yellow-green flowers in early summer. Enjoys part-shade. Height and spread 60cm. Euphorbia dulcis 'Chameleon'. Can cause skin irritation. Short arching stems of soft purple leaves in this easy clump forming Euphorbia. Happy in part shade. Height to 25 cms. Euphorbia griffithii 'Fireglow' Can cause skin irritation. Not for the faint-hearted, this strong growing Euphorbia will romp around displaying glowing bracts of a rich orange. Height to 1 m.
Euphorbia polychroma. Can cause skin irritation. Bold evergreen clumps of glossy, lobed leaves, flushed purple, and racemes of small white, marked pink, flowers throughout summer. Best in sun and well-drained soil. Height 60cm plus. Evergreen creeping geranium with glossy leaves turning shades of red in autumn. Large pink flowers held erect during early summer. Height to 30cm. Good ground covering geranium with bright pale pink flowers throughout summer. Height to 45cm. Good strong ground covering geranium bearing clusters of pale pink flowers. Height 30cm, spreading. Glossy foliage with dainty pale purple-pink flowers make this a charming geranium for a partly shaded site. Height to 40cm. Low lying bronze-green foliage with numerous vivid pink flowers. Likes sun and free draining soil. Height 12cm, spreading. Clump forming perennial with upright stems bearing open dark purple-black flowers. Prefers shade. Height 75cm. Vigorous, large clump forming magenta flowered geranium. Height to 75cm. Inclined to sprawl and self-seed but forgiven for its bright violet-blue flowers which are at their best in shade. Evergreen foliage which hugs the ground. Height 15cm. Deep purple-red single cup flowers and deeply divided leaves on this low sprawling Geranium. Height to 25 cms. Deeply cut leaves on spreading geranium sporting attractive pale pink flowers with dark veins. Height 15cm. Neat plant with vivid orange flowers during the summer. Likes sun and good moisture retaining soil. Height to 30cm. Rosettes of lobed, mid-green leaves and strong stems bearing double yellow open flowers. Height 75cm, spread 40cm. A scarlet flowered strain of the above. Compact geum with vivid orange single flowers borne throughout summer. Height to 25 cms. Glossy leaved geum bearing small intense yellow flowers on strong upright stems. Height to 40cm. Deeply cut silver leaves and brilliant yellow flowers make this a striking plant for sunny dry soils. May prove shortlived, but will produce lots of seed! Height to 45cm. Sprawling mat with clusters of tiny pink flowers in summer. Height 10cm. Large perennial sunflower with multiple bright lemon-yellow single flowers on strong stems. Height to 1.6 m.
Strong growing clump forming perennial with abundant strap-like leaves bearing many trumpet-like deep red flowers, each only lasting a day. Height to 70cm. As above, with yellow flowers. Height to 75cm. Smaller growing version of the above, with golden yellow flowers. Height to 35cm. Beautiful deep green glossy leaves make a neat clump, lilac flowers, very slug resistant. Height 40cm. Strong clump forming hosta with striking white varigation. Attractive lilac flowers in summer. Height 50cm. Lovely hosta with soft green leaves. Height to 25cm. Tiny hosta with simple green leaves and lilac flowers. Charming in a pot or rockery. Height 15cm. Soft silvery leaves and lemon-yellow flowers on a carpeting plant. Best in full sun. Height to 12cm. A slowly spreading perennial of stout stems bearing mid-green leaves and yellow narrow-petalled flowers in late summer. Height 75cm. Dark stems, dark green leaves, and bold bright yellow flowers. This is not a plant for the faint hearted! Needs room, sun and average soil. Height 2m. Spread 75cm - 1m. Vigorous Siberian iris with deep purple black flowers. Height 40cm. A number of Siberian irises are available. All enjoy damp soil in sun. Blue flowers in a globular formation on strong stems make this a striking plant in summer. Likes free draining soil in sun. Height to 40cm. Soft grey-green leaves form a mound of foliage above which lax, branching stems carry bright port coloured flowers throughout summer. Height and spread to 75cm. Clump forming perennial with deep purple and blue flowers borne in spring. Height and spread to 30cm. Fully double white flowers to 1 m.
Pale yellow single flowers to 75 cms. Fast growing perennial Shasta Daisy with large single daisy flowers. Good container plant. Height to 60cm. Unusual toadflax with strong stems cloaked in small leaves and bearing large yellow flowers. Best in sun and poor soil. Height to 75cm. Beautiful pink toadflax. Enjoys sun. Height to 75cm. A perennial Lobelia. Sturdy stems bearing long spikes of sky-blue flowers from a basal clump of green leaves. Happiest in sun on moisture retaining soil. Height to 60cm. Low growing evergreen mound of narrow leaves producing many spikes of dark purple-red flowers in late spring. Height 40cm spread 25cm. Bushy plants of mid-green foliage produce long spikes of rose coloured flowers. Loved by butterflies and bees. Height to 80 cms. Taller form of the above with paler flowers. Evergreen clump-forming plant with black strap like leaves. Popular with designers! Spreads. Has undistinguished lilac flowers. Best seen against a contrasting ground covering material e.g. fine gravel or shell. Height to 25 cm. A bold red perennial poppy. Likes sun and well-drained soil. Height 1.2m plus, spread 60cm. Pink, hooded flowers on a clump forming perennial with attractive heart shaped leaves, likes a sunny site in rich soil. Height to 50cm. Mound-forming variety, with creamy pink flowers. Height to 40cm, spread 45cm. Sumptuous blood-red double flowers held high above silvered strawberry-like leaves. Position at front of the border! Height and spread 50cm. A rosette of mid-green leaves bearing apricot candelabra flowers. Likes an open moisture retaining soil, in sun to part shade. Height to 45cm. A bold clump of broad, green, spoon-shaped leaves with large heads of yellow, sometimes pale orange, fragrant flowers. Enjoys moisture retaining soil. Height 80cm -1m. Spread 40cm. 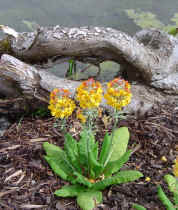 Robust primula with large bright magenta red flowers on strong stems. Height and spread to 45cm. As for P. bulleyana, but with bright pink flowers. Large. Tall stems produce striking black cones lacking the ray florets of usual daisies. Unusual and imposing. Height 1.2m plus. Spread 60cm. Attractive grey-green foliage and tall spikes of dark pink fluffy tassle flowers. Height to 65 cms. A mass of pretty leaves divided into oval leaflets bearing spikes of dark red brown flowers. Happiest on moist ground. Height 1.7m, spread 60cm plus. Ferny foliage and spikes of white bottlebrush flower heads. Height 1m, spread 50cm. A dwarf scabious with large pale blue-mauve flowers in summer. Height to 12cm. Unusual large scabious with white flowers. Likes sun. Height 1.2m, spread 50cm. Tall, airy, with pale yellow flowers held on sturdy stems. Happy on well-drained soils in sun. Height to 45 cm spread 25cm. Attractive glossy foliage and strong stems bearing many large white flowers. Tolerates most soils and open positions. Height to 90cm, spreading. Whorls of large purple-blue flowers on strong stems above wrinkled leaves. Height to 50cm. Large, white cornflower-like flowers on sturdy stems throughout summer. Height to 50 cm. Blue-purple form of the above. A rosette of purple foliage and racemes of pink-cream flowers on this dainty woodland plant. Height to 50 cms. A basal clump of pretty divided leaves and tall stems of mauve fluffy flowerheads in summer. Height to 1.5m. Very pretty thalictrum with blue-green divided leaves and large open panicles of mauve flowers with prominent dangling yellow stamens. Best in a sheltered site, in sun and well-drained soil. Height 1m. Spread 60cm. Similar to T. aquilegiifolium, bearing clusters of pale yellow fluffy flowers. Height to 2m. A lovely plant for dappled shade with heart shaped pale green leaves turning pink and red in autumn. Numerous stems of small starry flowers in summer. Height to 30 cms. Low rosette of mid-green leaves and a strong stem sporting many open white flowers. Height to 60cm. Spread 40cm. As above with rosy purple flowers.